It’s a showdown for the District 2-6A title also known as the Little Southwest Conference, as first place Odessa Permian travels east to take on the Midland Lee Rebels at beautiful Grande Communications Stadium. Permian struggled for a little while against a Wolfforth Frenship squad that’s winless in district play, but the Panthers got things rolling down the stretch in a 38-10 victory. Texas-commit QB Peyton Powell did not play in the game last week and after falling behind 10-7 midway through the second quarter, MOJO got the offense going scoring 31-straight points as RB Ed Williams carried the load rushing for 103 yards and three touchdowns. Expect Powell to be back this week for the Panthers who will need all the offensive punch they can muster against the explosive Lee Rebels attack. Midland Lee easily dispatched of crosstown rival Midland High last week 49-28 in the 2018 installment of the Tall City Classic. QB Felix Hinojosa returned from an injury and put together a flawless effort as he had 177 rushing yards and three touchdowns on only five carries. Hinojosa was perfect through the air also, completing all seven of his passes for 159 yards and two touchdowns. This game will ultimately come down to which defense can step up and make plays and get the opposing explosive offense off the field consistently. On paper, Permian looks to be the favorite, but when healthy, Midland Lee is an incredibly tough out and a sleeper contender in Region I Division II. Don’t be surprised if Midland Lee pulls the upset at home and earns a share of the district title. It’s a huge season finale involving two Arlington ISD schools in what may be the biggest AISD matchup in the past 15 years. The city’s two most storied programs with the biggest fanbases meet up both at 9-0 with the District 4-6A title on the line. From a playoff perspective, this game doesn’t hold much intrigue as Arlington is locked into the top seed in Division II and Lamar is locked into the top seed in Division I, but don’t tell either school that, this one will be intense. Arlington comes in after cruising to a 45-16 win over Arlington Sam Houston last week. The Colts didn’t need a big game from QB Jhari Rogers as the supporting cast did more than enough to carry the load in a balanced win. Arlington Lamar maybe had its best showing of the year last week as the Vikings ripped past a good Arlington Bowie squad, 49-14. WR Trevon West returned the opening kickoff for a touchdown to ignite Lamar, while QB Jack Dawson accounted for four touchdowns to lead the way for the Vikes in the lopsided victory. Both offenses are among the best in DFW, but in these big playoff type games it comes down to defense and the Arlington High defense has been the more consistent unit thus far. Waco Midway can wrap up another district title this week with its 34th straight district win if it can knock off an explosive Belton squad. The Panthers, who went into Temple last week and knocked off the undefeated Wildcats 31-28 will need to avoid a letdown this week as there’s no doubt Belton is good enough to push Midway. It was a physical, smashmouth brand of football that carried the day for Midway in its win last week as James Fulbright ran for 220 yards and two scores and Midway’s defense was outstanding against a high-powered Temple attack. Belton in its first game without QB Connor Carouthers fared quite well as the Tigers demolished Waco High 63-7, as Denver Holman returned a kickoff and punt for a touchdown and WR Anthony Brown hauled in four touchdown catches to lead the Tigers. This one will come down to tempo once again. Last week, Midway lured Temple into its kind of game and the Panthers thrived. If Waco Midway does the same thing and keeps Belton off the field, it will secure another district title. A share of the District 31-6A title is on the line in Edinburg this week as Weslaco East will look to bounce back from its loss to rival Weslaco in the Tinaco Bowl, while Edinburg Vela looks to cap its second straight unbeaten regular season. It looked like Weslaco East would get the win over Weslaco as Ramsey Vasquez scored three touchdowns, but the Wildcats allowed a late field goal that dropped them 4-1 in district play in the 23-21 loss. Now WEHS will have to try and pick itself up off the mat this week against what most consider the Valley’s top team. 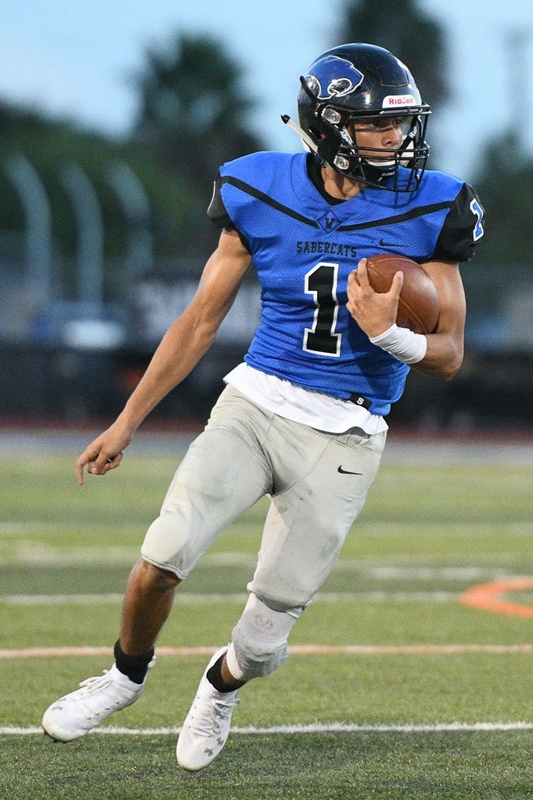 Vela got a test from its main rival Edinburg High, but behind a big game from QB AJ Sotelo, the Sabercats escaped with a 24-14 win. The win was a bit tempered as Edinburg Vela suffered a couple of key injuries along the offensive line and that could certainly limit the explosiveness of the Vela attack. Upstart Tomball Memorial has proven to be a tough out in its first season at the 6A level and can earn a share of the District 14-6A title this week with an upset win over unbeaten Cypress Ranch. The Wildcats rolled up 574 yards of offense last week in an easy 56-14 win over Cypress Park led by WR Logan Kyle who hauled in three touchdown receptions to pace a dominant offensive attack. The task is quite large this week against a Cy Ranch squad that prides itself on tough, physical defense and a brutal running attack but at the same time when the Mustangs need to put the ball in the air, they are deadly efficient. Last week, the Mustangs scuffled on the road at Bryan in a 27-0 win. The Cy Ranch offense put up 20 second-quarter points, but only managed a single score in the other three quarters, however the defense was up to task holding the Bryan offense to just 141 yards of offense. Don’t expect two straight sloppy outings from the Cy Ranch attack. Look for the Mustangs to establish the run early, force Tomball Memorial to stack the box and when that happens big plays in the passing game should follow. Katy has once again proven its dominance within Katy ISD and can complete another unbeaten district run with a win over now playoff bound Katy Taylor. 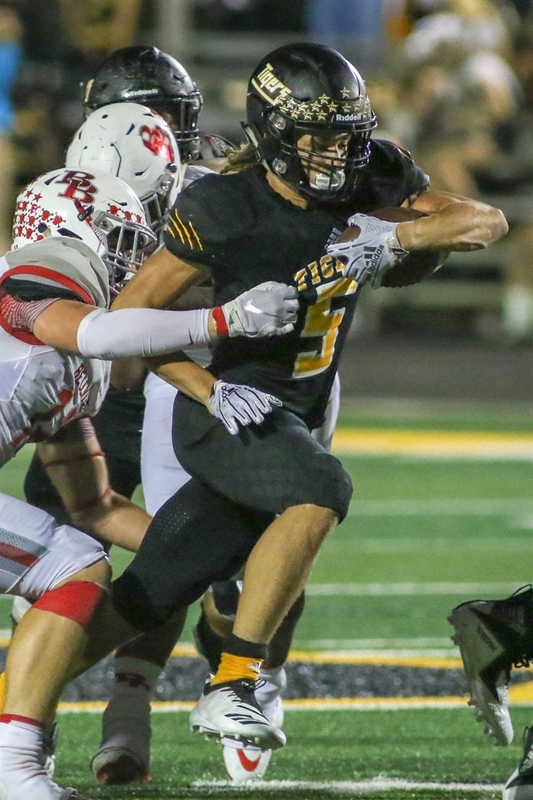 Last week was just another night at the office for the Tigers who blasted Katy Mayde Creek 62-3 as it was a balanced effort all night from the Katy offense as star RB Deondrick Glass had a pair of touchdown runs and RB Dawson Gonzales also accounted for two scores in the win. Katy Taylor actually clinched a playoff spot last week without winning a game, as the right results took place for the Mustangs to advance. Katy Taylor is built to keep the game low scoring and may be the only team in the district who has some of the personnel to at least push Katy in the trenches. The problem for Taylor in this game is it doesn't have the dynamic playmakers at the skill spots that Katy has and eventually the Tigers will break off some big plays. Schertz Clemens didn’t inspire much confidence in upsetting unbeaten Judson this week as the Buffaloes were stunned by New Braunfels, 26-23. Two key turnovers and Clemens’ inability to get off the field on third down proved to doom the Buffaloes last week and that’s not a good recipe for success against a Judson team that once again has the feel of a contender in Region IV. The Rockets did what was expected of them last week and dominated an overmatched San Antonio East Central squad, 51-14. QB Mike Chandler continued to improve and he’s fully settled into the Rockets' offense and RB Sincere McCormick is thriving in his Swiss Army Knife role for the Judson offense. Expect the Rockets to come out fast in this one and turn this one into a laugher in short order. Del Valle will travel to the northeast side of the El Paso for a massive 1-5A Division I showdown for second place and the right to host a first round playoff game. The loser is facing a potentially long road trip to Abilene. Del Valle took care of business last week blowing past El Paso Eastlake, 44-7, as QB Raymond Montez and that Conquistadores' spread offense was sharp and the DVHS defense had what is probably its best game of the year. El Paso Chapin took care of their end of the deal easing past El Paso El Dorado 34-13. The Huskies' speedy offense will pose a test for the ultra-aggressive Conquistadores defensive unit. If Del Valle can stay disciplined and not over-pursue and get caught out of position, Montez and that offense will put up enough points. It’s a loaded Thursday night slate in the DFW area and this battle of undefeated teams is right up there as one of the best games. Surprising Birdville was thought to be a potential playoff team going into the season, but no one pegged the Hawks to be 9-0 at this stage. Last week, the Hawks rolled past Colleyville Heritage 51-24 as RB LaDerrious Mixon ran for 270 yards and two touchdowns and also hauled in a 33-yard touchdown reception to lead a Birdville offense that rolled up 680 yards of offense. Denton Ryan blasted past Grapevine, 52-14, as sophomore WR/DB Billy Bowman did a little bit of everything throwing a touchdown pass, getting a touchdown reception and picking off a pass as well. The Ryan offense, which at times struggled early in the season, appears to be hitting on all cylinders now and has scored 48 points or more in every district game. As outstanding as both of these offenses have been all year, this game comes down to the Denton Ryan defense. The Raiders have a ferocious defensive line that has absolutely lived in the opposing offenses backfield all year, that group is a difference making unit and leads the Raiders to another district title. This battle for second place in District 8-5A Division I has a ton on the line as the winner gets to host a playoff game and the loser is looking at a trip all the way to Mesquite in the first round of the playoffs. College Station’s defense has been outstanding the last two weeks as the Cougars have allowed just seven points. Last week CSHS knocked off Tomball 21-0, allowing an explosive THS passing game just 96 yards. After a slow start, the Cougars got things going as sophomore RB Roderick Brown carried the load with 102 rushing yards and a touchdown. The Cougars offense will need to be playing at a high level this week going against the Magnolia West offense that’s led by QB John Matocha who accounted for all four Mustangs touchdowns in a 28-27 win over a desperate Magnolia squad fighting for the playoff lives in a rivalry game. Matocha had 309 yards of offense and ran for two scores and threw for two others. On paper, this looks to be a very even matchup and both have similar resumes. We’ll give the slight edge to Magnolia West in this one because the Mustangs are at home. Seguin, with a win at home, can wrap up an undisputed District 12-5A Division I title and don’t look now, but this is definitely one of the hottest teams in the state at the moment. After their big win over Dripping Springs two weeks ago, the Matadors had no signs of a letdown last week as SHS drilled Austin Lanier 63-0. They’ll need to keep that focus this week against a very good LBJ squad that has skill talent all over the field and can put immense pressure on a defense. 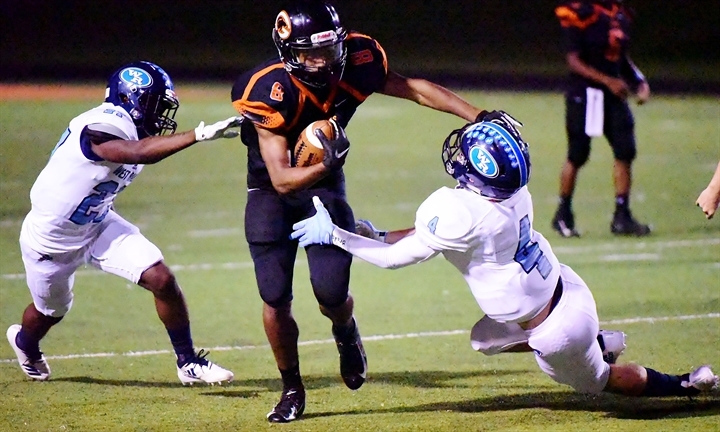 The Jaguars also earned a 63-0 win last week and took care of an overmatched Austin Travis squad. Austin LBJ will put some points up on Seguin. The team are too explosive to get totally shut down, but I’m not sure the Jags' defense can slow Seguin either and with a big and loud home crowd behind them, Seguin is proving to be tough to beat at home. Sealy can complete an unbeaten regular season with a win over a Needville squad that has been hit with some key injuries, but still managing to grind out important district victories. Last week, Sealy exploded for 35 first-half points as the Tigers rolled to a 42-17 win over West Columbia. RB Ivan Bolden continued his outstanding season rushing for two touchdowns and hauling in a 19-yard touchdown pass to lead the Sealy attack. QB Kenny Hrncir accounted for both Needville touchdowns in a hard-fought 14-13 win over Brazosport last week, the Blue Jays were without star RB Ashton Stredick who sat out the game with an injury and his status for Friday night is uncertain. If Stredick plays, Needville certainly has the firepower to pull the upset, but if he’s rested again this week in preparation for a playoff push, Sealy gets the big edge. It’s Mid-County Madness and if it wasn’t already a huge game in the Golden Triangle, let’s add in the fact that it’s for the 12-5A Division II district title as well. Bottom line is, this game is must-see television year in and year out and it’s likely to deliver once again. Unbeaten Nederland rolled past Crosby 45-22 as QB Blaysin Fernandez threw for four touchdowns and ran for another touchdown all in the first half as he sat out the second half with the Bulldogs holding a comfortable lead. Port Neches-Groves didn’t show any ill-effects from losing a game off the field with a forfeit as the Indians knocked off Barbers Hill 31-14 as QB Roschon Johnson accounted for 443 total yards and four total touchdowns in the win. The real key for PNG in this one was the Indians' defense, which played maybe their best game of the season. If that unit continues to play well, there’s no doubt Port Neches-Groves can play with just about anyone in Region III. A year ago, unbeaten PNG went into Nederland as a favorite and left with a heartbreaking last-second loss. The roles are a bit reversed this year as unbeaten Nederland looks to be a slight favorite and the game is in Port Neches. Could history repeat itself this year? My pick is yes, this time PNG gets a bit of revenge and knocks off Nederland to earn the district crown. Kerrville Tivy can wrap up the 14-4A Division II title this week with a win over a Medina Valley squad that saw its seven-game winning streak snapped at the hands of Alamo Heights. Medina Valley jumped out to an early lead on Alamo Heights, but allowed 28 second-quarter points and that was the undoing in a 35-21 loss. RB James Gipson had a big night for the Panthers rushing for 231 yards and three touchdowns, so expect MVHS to try and grind the game out and keep that explosive Antlers offense off the field. Tivy’s rush defense did struggle last week in a 62-48 loss to Lockhart. The Antlers allowed over 500 yards on the ground to Lockhart but the Tivy offensive attack continued to show why it's one of the best units in all of South Texas and accounted for over 600 yards on the night. Medina Valley’s defense doesn’t look to be able to stop Tivy, so unless the Antlers put the football on the ground, they’ll win another shootout. A district title is on the line out in Texoma as Van Alstyne visits one of the real surprise stories in the state in the 8-1 Bonham Purple Warriors. After a slow 1-3 start to the season, Van Alstyne a has found its stride in district play and that role continued last week with an easy 60-0 win over Howe. In the win, it was the Panther defense that stole the show allowing just 24 total yards of offense and zero first downs on the night. QB Rhett Gallagher threw for 153 yards and three touchdowns in the victory. Bonham’s offense continues its torrid pace led by QB Tyler Rodriguez who was again sensational (578 yards of offense and six touchdowns) as the Purple Warriors rolled past Commerce, 63-27. Bonham’s offense has been almost unstoppable since its season-opening loss to Mount Vernon, scoring at least 42 points in eight straight games. Bonham’s defense has shown some vulnerability along the way during this eight-game winning streak and that could be the difference, especially when it plays a team that has the ability to get stops on defense. This week, Bonham faces a defense that’s probably the best unit it's gone against since that Week 1 loss and I’m not sure the Warrior defense will be able to hold out if their offense starts to scuffle. A battle of teams who were in Class 4A a year ago will decide the district title in 8-3A Division I as Tatum will look to complete an unblemished district run. The Eagles rolled past Mineola, 52-21, last week behind four total touchdowns from QB OB Jones who ran for a pair of scores and threw for two other touchdowns. Tatum’s defense will have quite the test this week trying to slow down a Gladewater offense that’s predicated on being physical and running the ball and then hitting you over the top with the deep ball. Last week in a 28-16 win over a surging Sabine squad, it was sophomore RB Eli Carter’s 96-yard touchdown run which swung momentum to the Bears after a big goal line stand. These two old rivals know each other well, no secrets in this one. It’ll be old school smashmouth football from both out in East Texas with a slight edge to Gladewater at home. A big play in the passing game proves to be the difference. The state’s biggest surprise story has to be the San Saba Armadillos who after a 3-7 record a year ago have exploded with a 9-0 record in 2018 and not only is San Saba unbeaten but the team has been flat out dominant with their closest game this year being last week’s 41-14 win over Crawford. QB Sean O’Keefe threw three touchdown passes and RB Eli Salinas ran for a pair of scores as San Saba turned an early 7-0 deficit around quickly with 41 straight points in the win. After some struggles in non-district, DeLeon has found its groove and put together what was easily the best effort last week in a 77-7 rout of Goldthwaite. QB Kevin Yeager threw for 322 yards and four touchdowns, while Toby Garrison added balance with 109 yards rushing and a pair of scores to lead an offense that rolled up 639 yards. The key in this game is how San Saba will respond to getting truly tested for four quarters, which is something that hasn’t been done yet this year. I’ve been somewhat skeptical of the Armadillos all year but I think at home in a stadium they call The Graveyard, the ‘Dillos complete a remarkable regular season. After a really rough non-district slate in which the Elks went ani un-Stratford like 2-4, SHS has bounced back in district play and looked like the team we thought could compete for the Region I title in the pre-season. Last week, Stratford rolled past Booker 64-6 as six different Elks found the end zone in a balanced effort. SHS jumped out to a 28-0 lead and simply never looked back. Gruver held up its end of the bargain to set this showdown up as the Greyhounds had no trouble with Clarendon, 47-15. Gruver will want to speed this tempo up and jump out to a quick start and put the Elks in a hole early. Stratford is ground-oriented and prefers to not to be in obvious passing situations, so if Gruver can make the Elks play from behind that certainly plays into their favor. 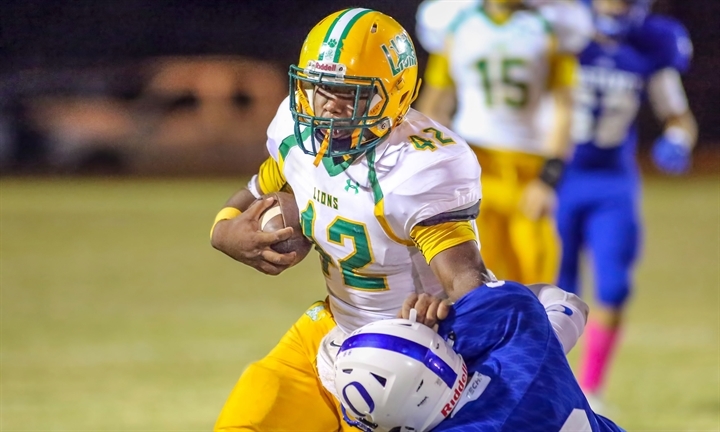 The game of the night on the South Plains will without a doubt be Sundown heading to New Deal to take on the unbeaten Lions with a district title on the line. Sundown, after a sluggish first half in which it only led by six points at the break, exploded in the second half to cruise past Olton 47-14. New Deal rolled past Post 32-7 behind QB Jett Whitfield and his 340 yards of offense and three touchdowns. Both teams have established themselves as being on the short list of contenders in 2A Division I Region I. Don’t be surprised if this is the first of two meetings but in the first matchup we lean to the home team New Deal which has Whitfield and Iowa State commit DK Blaylock leading the charge. Another district title is on the line this week, this time out in the Big Country as unbeaten Hamlin looks to knock off red-hot Albany. Hamlin’s been a wrecking machine all year. The Pied Pipers absolutely drilled a good Cross Plains squad (That pushed Albany two weeks ago), 47-0. The Hamlin defense was the story and picked off six passes while RB Jackson Sepeda rolled up 135 yards and two rushing touchdowns on just nine carries. Albany escaped a late rally from Haskell last week to hang on for a 20-19 win. Cutter Edgar led the Lions offense with 243 yards on the ground and a pair of touchdowns. Don’t let Albany’s subpar record fool you, the Lions played a brutal non-district slate and are still a tough out, but this Hamlin team has the look of a squad that could make a deep push into the playoffs. Big rivalry game between DI top 10 ranked teams as Garden City travels to Sterling City for the district championship game. These two schools have played each other at least 77 times since 1938 with Sterling City leading the series 45-30-2. However, the Eagles will be flying against the wind in this year’s contest. Garden City’s defense is one of the toughest in 1A allowing just 10.78 points per game and one big factor in that is the Bearkats have 26 total defensive take aways as a team (13 fumble recoveries, 13 INTs). LB Cesar Chavez leads the defense with his 112 tackles this season. Sterling City features a solid defense which has allowed just 14.44 points per game and has a play maker on offense in back Wyatt Sisco who has rushed for 1,111 yards and 25 TDs and thrown for an additional 470 yards and 11 TDs. However, I think the Bearkats defense is just too much for the Sisco and the Eagles to overcome. DI district two title game. Both schools claimed upset victories over district favorite Happy who will miss the playoffs for the first time since 2011. Nazareth RB Nathaneal Van Dijk has been a key part of the Swifts offensive attack. On the flip side for the Buffaloes have a balanced run attack with freshman RB Kaden Parraza being one of the best freshman in 1A and fellow RB Sergio Alvarado also able to eat up yardage on the ground. Battle for 2nd place in DII district 16. Cherokee has won the last two meetings in 2013 and 2015, but the Panthers hold the all-time series with a 13-7 record. Cherokee has some very good running backs, namely Tristian Arkansas who has a couple of 300+ yard games to his credit, and Blazie Lopez, so the Indians will be able to move the ball well on the Panthers. However, that Indian defense is prone to giving up points and the big play. Panther Creek has a playmaker as well in Matthew Morris (79-1,076 yards, 16 TDs rushing; 127 yards, 5 TDs passing; 100 yards, 2 TDs receiving) who can make defenses pay in more ways than one. This should be a great matchup and tough to predict, but I’m going with Cherokee and their overall team speed to make just enough big plays to pull this one off. This game will decide the DII district 5 runner-up. Sierra Blanca was idle after their showdown with GR in week 9 so the Vaqueros should be rested up and ready for this battle. In contrast, Buena Vista is coming off a hard fought loss last week to Grandfalls-Royalty and may be a little banged up. This is a classic “who wants it more” game that will give one team a playoff berth and the other a quick start to basketball season. While many feel Sierra Blanca is the underdog in this one, I’m sticking with the well-rested home team to pull off the upset.